Manufacturer & Trader of Gas Manifold. Our product range also comprises of Barbeque Grill, Refrigeration Equipment and Cooking Equipment. With the assistance of our deft team of professionals, we are able to introduce a broad array of Gas Manifold. 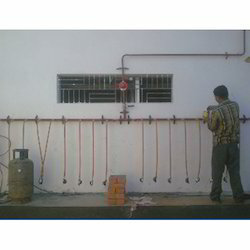 Such manifold and pipe is installed and use at eateries, restaurants, hotels, commercial kitchen and food stalls. This manifold and pipe line is comprises of high quality pipes and materials, which offer resistant to corrosion and leak proof tenure. It is manufactured adhering to international industry standards and quality norms. In order to ensure high safety, our professionals opt for strict quality tests made on the complete manifold and pipe setup. Looking for Gas Manifold ?